OK, I just had to add this photo because that scenery! Ahhhh! Did we see what we thought we saw? 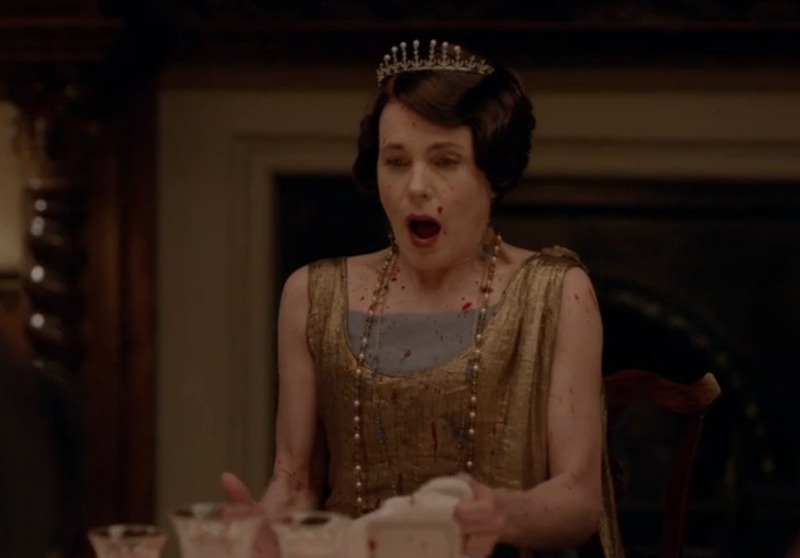 Was anyone else this week transported back to an earlier time in Downton history when some crazy stuff went down? I’m guessing the writers wanted the series to go out with a bang as big as the one they started with. Alright, why don’t we just start out with the scene that everyone’s talking about. Let’s just get it all out on the table, shall we? Oh wait, Robert just did. Let me set for you a different scene. Not the one on the screen with everyone sitting around the dinner table with Neville Chamberlain, sipping wine and eating delicate savories. No, the scene I want you to imagine right now is the scene in my family room where my husband, daughter Kate, and I are sitting around in our sweats watching this genteel family bicker and rage against one another, behaving very badly in my estimation, in front of a Minister of State. We’re enjoying the banter, laughing about Violet and Isobel, and catching innuendoes that are flying across the table, when all of a sudden . . . Cue screaming and “OH MY WORD!! !” and incredulous laughter. We rewind the T.V. and watch Robert ralphing blood across the table five times before we actually believe that what we thought we saw was actually what we really had seen. Crazy stuff, I’m telling you. It was raucous, and it took a few minutes to catch our breath before we could go on and watch the rest of the episode. But, you know, aside from Robert’s melodramatic confession of love toward Cora while he’s lying on his left side (thank you for that, Dr. Carson), there really weren’t any great lines that came out of that scene. 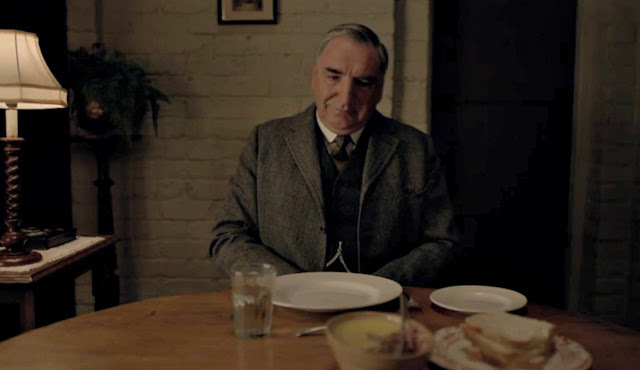 So, even though Robert’s explosion across the table was one of the top five scenes in Downton Abbey history, it doesn’t make my top five lines list because there really weren’t any great lines there. So, now that I’ve managed to talk that scene to death, let’s move on to my five favorite lines from Episode 5. I’ll be honest, I had a hard time narrowing it down. But I say that every week, don’t I? So if I overlook one of your favorites, won’t you leave me a comment and let me know what line you liked best? Moving on, in no particular order. 1. As long as we’re talking about the Robert incident (The Great Robert Ralph as it shall forever be known), I loved how the servants all stayed up waiting for news of their lord. Doesn’t that just kind of sum up things for the servants? They see and hear all kinds of things upstairs—unsavory things, rude things, unbelievable things—but it’s not for them to have an opinion or even pretend knowledge about. It’s just not their business. 2. So much this week was not spoken, but an exchange of looks. It’s all downstairs people—they are the ones who get what’s going on but can’t express their emotion (see #1 above), so they do it with a glance or a smile or a raise of the eyebrow. I guess they do get to express their opinion in more subtle ways. There were so many lovely looks exchanged this week, but one of my favorites was when Andy came to Mr. Mason’s rescue in front of Tom and Mary, offering to help with the pigs. Daisy looked up, clearly caught off guard by Andy’s chivalrous nature, and smiled a smile so wide that you’d have thought she’d never seen him before. I have a feeling Andy had noticed Daisy before, though. 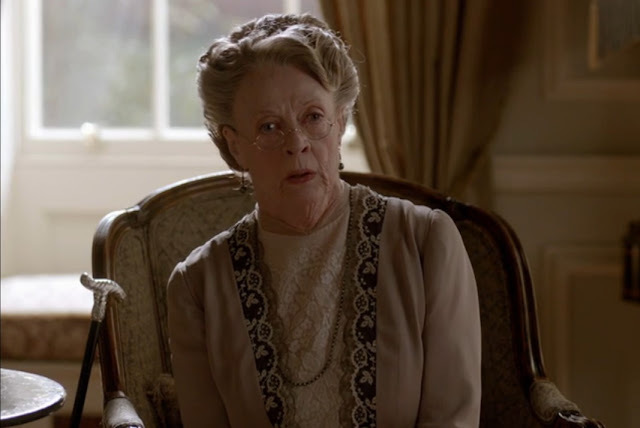 And then the looks, veerryy subtle, between Mrs. Patmore and Mr. Mason. How cute was that? Another moment in which I just thought, what?! I also loved when Mr. Molesley was teasing Miss Baxter in the courthouse, asking if she’d like to see if her criminal friend would like to go change his plea. She also smiled broadly for, oh, about the first time ever. Hopefully Baxter can unwind just a bit, now that her legal troubles seem to be over. 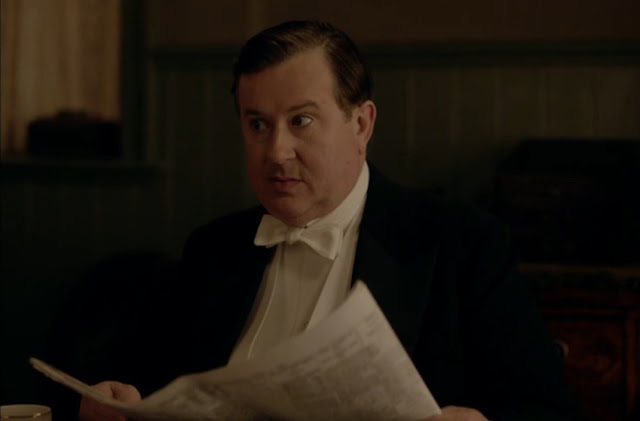 I think the king of the sideways glance and the raised eyebrow, though, is Spratt. This week was no exception as he sat behind his newspaper, thrilled to watch Denker squirm in front of him, eyes raised and humming not-so-silently to himself. 3. Speaking of Denker. I have never liked her character. At. All. I’ve even wondered why they’ve kept her around. So you could imagine my glee (and then my horror!) when she got herself into trouble this week by speaking her mind to Dr. Clarkson. Violet receives a letter from Dr. Clarkson telling her about Denker’s bad behavior and almost has a heart attack. She immediately sacks Denker, but Denker won’t go down without a fight, talking back and trying to defend herself. 4. Let’s go back to the infamous dinner. 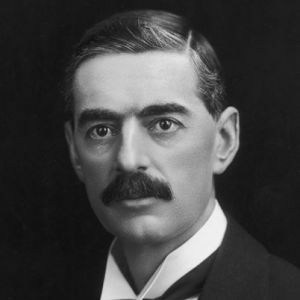 Neville Chamberlain is the Minister of Health at that point in history, and he’s brought in by Violet to be persuaded to step in and stop the takeover of the hospital. Now, I knew the name Neville Chamberlain, and I suppose this scene would have meant a lot more to the Brits watching it than to me, a stupid American who can’t remember her pre-WWII history. This is where my very smart husband came in handy. He remembered that Chamberlain was actually the Prime Minister at the beginning of WWII, and that he was the one who wanted to play nice with Hitler. He was a conciliatory type, just wanting everyone to be happy. 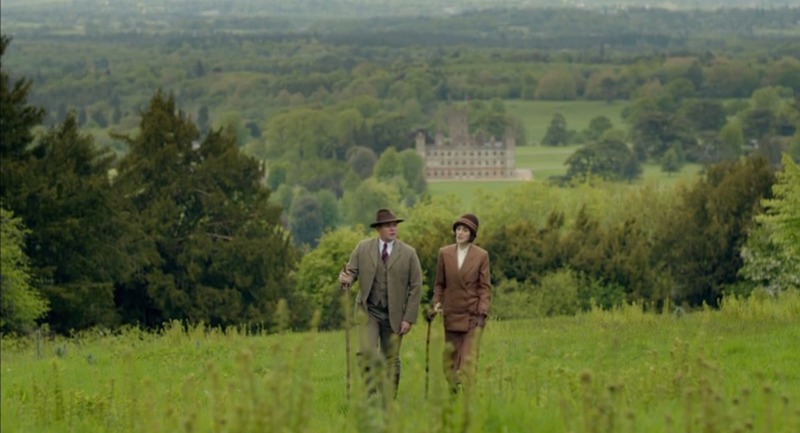 So here he sits with the bickering Crawleys or Granthams or whatever you call them, and his eyes dart back and forth between Violet and Isobel who, neither of them, won’t back down. 5. Finally, how could we forget dear Carson and Hughes? Marital bliss, am I right? First of all, it never really occurred to me until this week that Mrs. Hughes wouldn’t know how to cook, but of course she doesn’t. She’s been a working woman all her life, but not in the kitchen. 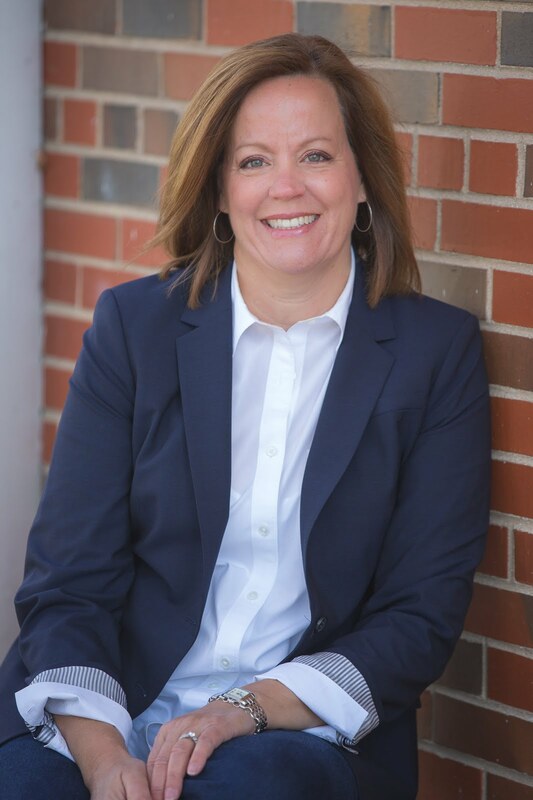 She’s had her meals prepared for her as much as the folks upstairs have had, so when it comes to taking care of her husband, as Mr. Carson would surely expect, Mrs. Hughes doesn’t have a clue. So Carson wants to have a cozy dinner together in their cottage. Newlywed stuff. So sweet. The best line in this scene isn’t so much a line, per se, but a look again. As Mrs. Hughes sits down to her own dinner, she takes a spoonful of the delicious bubble and squeak (it is, after all, a vegetable, you know) and forcefully plops it onto her plate, giving her new husband a look that could kill. Oh Mr. Carson, you’ve got a lot to learn. Welcome to married life, Mr. Carson and Mrs. Hughes!!! Now tell me, what did I miss? What was YOUR favorite line of this episode? Leave me a comment! Your thoughts are ALWAYS worth the wait my dear! Although I have since learned the importance of a "Chamberlain moment", I too did not remember ever learning about him in history class. But I guess I overlooked the comment he made when I watched it (2 times) because of the exploding blood scene. Katrina happened to be home and isn't really a Downton watcher but we both gasped and were saying "oh my" during 'the scene'. I loved all the looks as well this week. Though I love happy endings I kind of fear that the writers are going to pair everyone up with someone else to make for happy endings for all. That is nice, but not really very realistic. It would be so wonderful for Mrs. Patmore and Mr. Mason to have each other to live out their lives with but not sure it would make Daisy very happy. What's up with her? 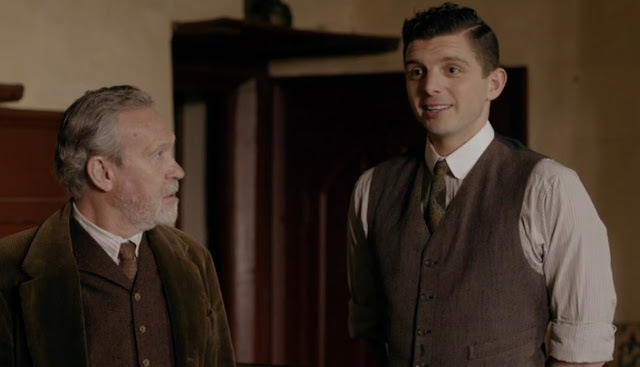 Also loved how Tom just cut to the chase in encouraging Mary and what's his name Talbot to just admit they like each other. The barriers of showing emotions are loosening a bit. I'm so glad you liked the patty pans line because I was thinking 'oh boy, them are fighting words' when he said them. Your observations and the way you write about them are so fun! I might rewatch the episode just for Tom. 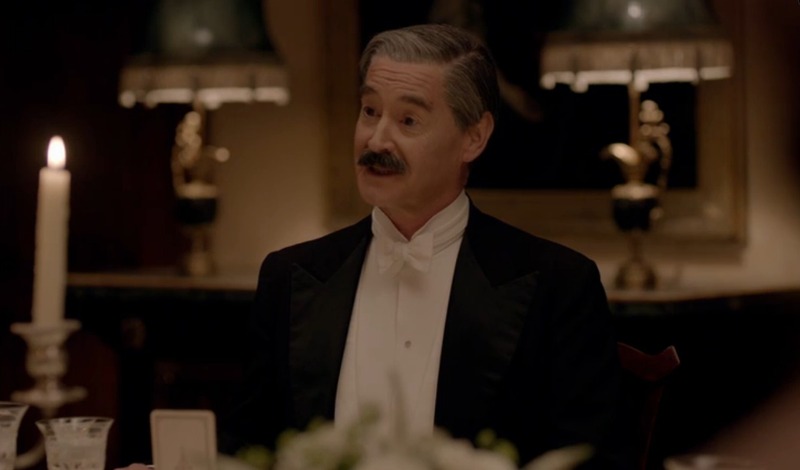 I think he was overlooked this week because of the dinner scene and the abundance of looks that could kill, but his one-liners with Mary were refreshing and bold and so much fun. I am so glad he is back!! I think Daisy needs a mention as well - how many times did she say that Mr. Mason was perfectly fine by himself and not lonely and why were people fussing over him?!? She was quite a pill! I look forward to Mrs. Patmore giving Daisy a stern lesson.